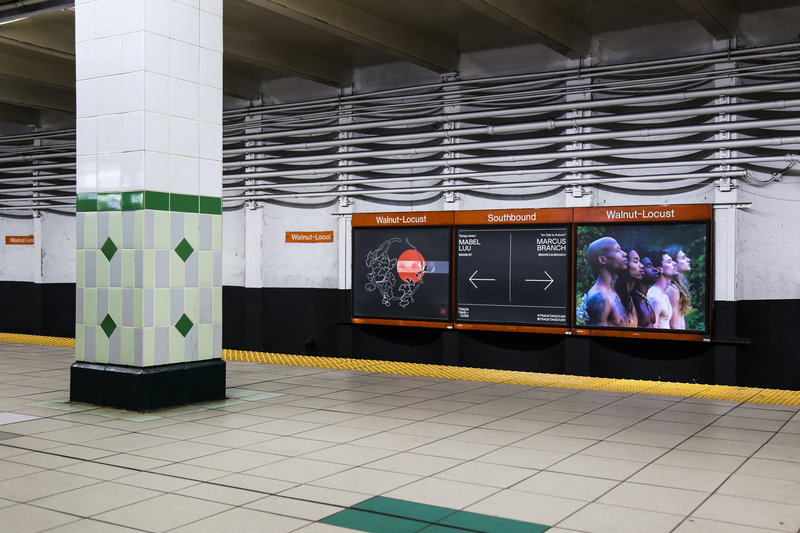 So excited to announce today that our 2018 Trashcan Takeover initiative has evolved this year into Track Takeover, transforming SEPTA’s Walnut-Locust Station into a temporary underground art gallery by replacing all 110 advertising spaces with artwork from 30 Philadelphia artists! The brainchild of Brendan Lowry (of @Peopledelphia fame) via his creative consultancy, Rory Creative, with funding and support again this year from the folks at City Fitness, I’m pumped to join the project for a second year as well as Media Partner. 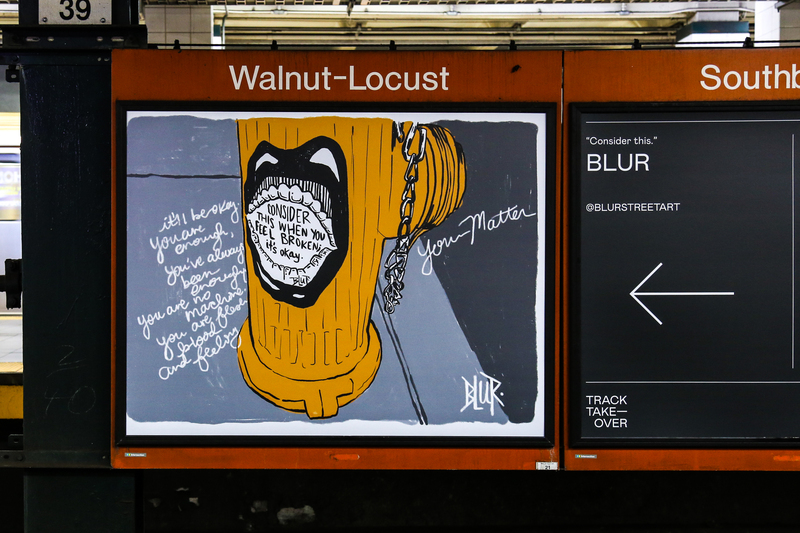 Aside from the fact that we get to support and elevate the work of local artists in a big way, my favorite thing about these takeovers is that they invite a citywide conversation. 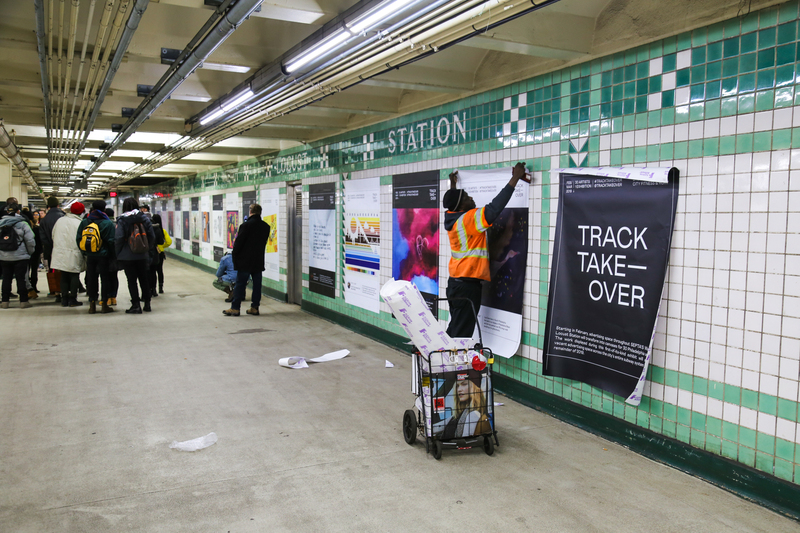 Both #TrashcanTakeover and now #TrackTakeover ask us to think about the value of our pubic space. 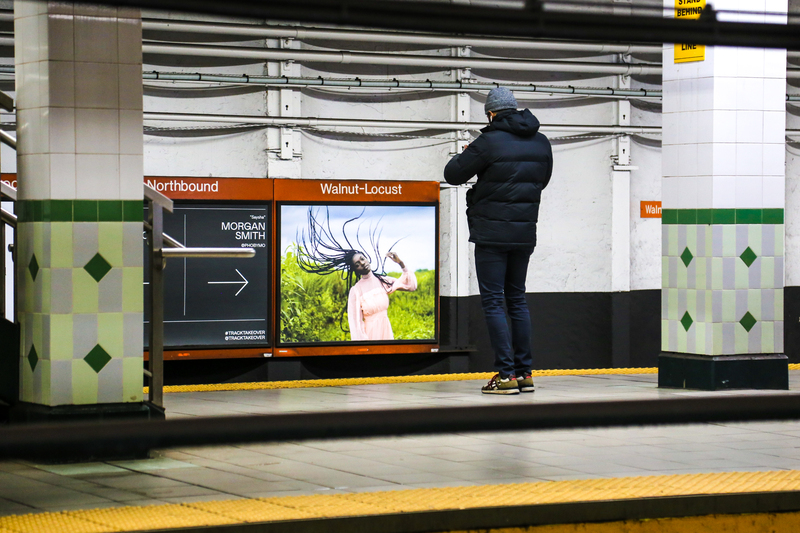 It asks us to think about what we see and experience as we move through our city, and what we want to see. 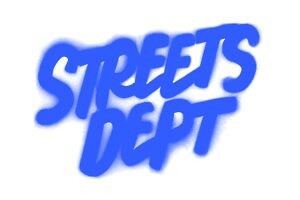 I think of it as an exercise in civic awareness and empowerment! 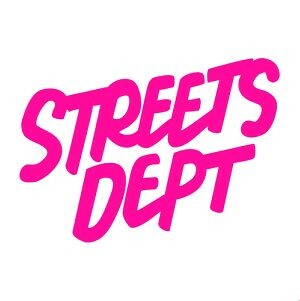 The 30 final artists were curated by Rory from an applicant pool of 506 after Peopledelphia and I shared a “Call For Artists” on our Instagrams in December. 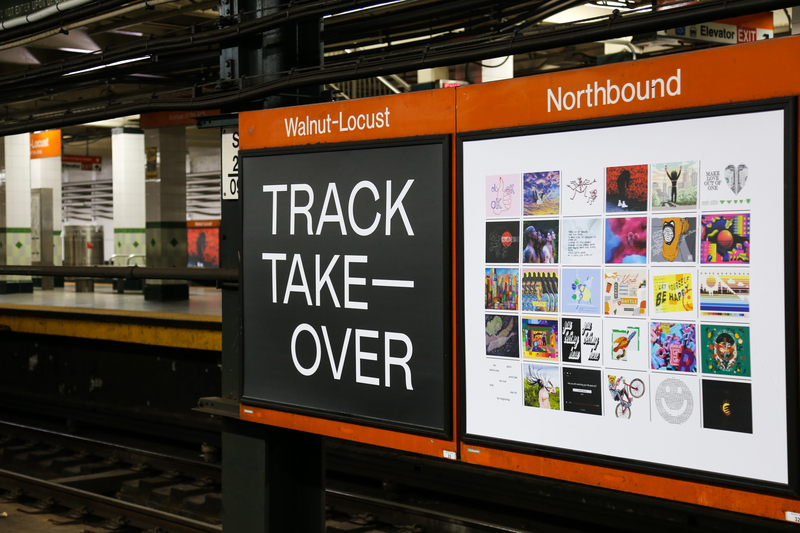 Here’s the full list of the incredible artists participating in Track Takeover: Aaron Ricketts, Morgan Smith, Loveis Wise, Sean 9 Lugo, Margo Hurst, Dewey Saunders, Gianni Lee, Zach!, Ali Williams, Marisa Velázquez-Rivas, Darren T. Burton, Nikki Volpicelli, Lisa Conn, Tony Trov and Johnny Zito, Jordan Moss, Mabel Luu, Jordan Plain, Rachel Joy Victor, Bij Lincs, Blur, Saeed Ferguson, Allegra Yvonne Gia, Marcus Branch, Nero, Kim Lincon, Renitent, Ryan Evans, Nick Massarelli, Oh Gee Woh Gee, and Glossblack! 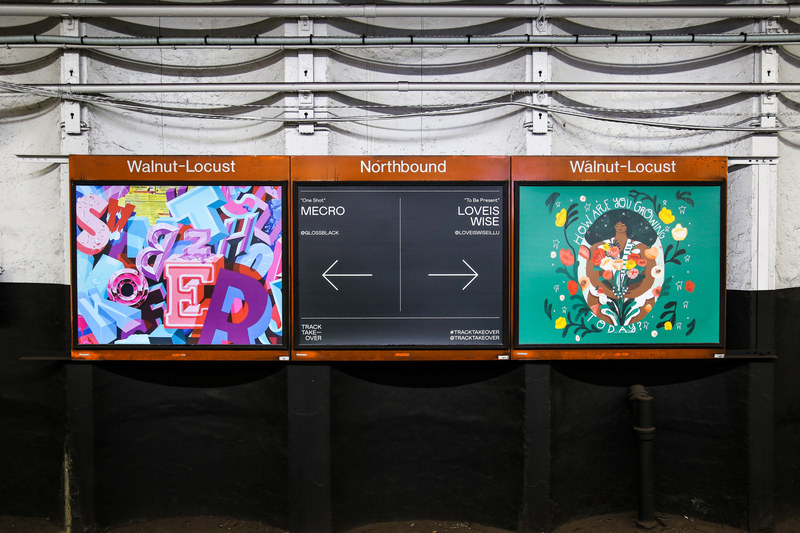 The exhibit at Walnut-Locust activates all areas of the subway station. 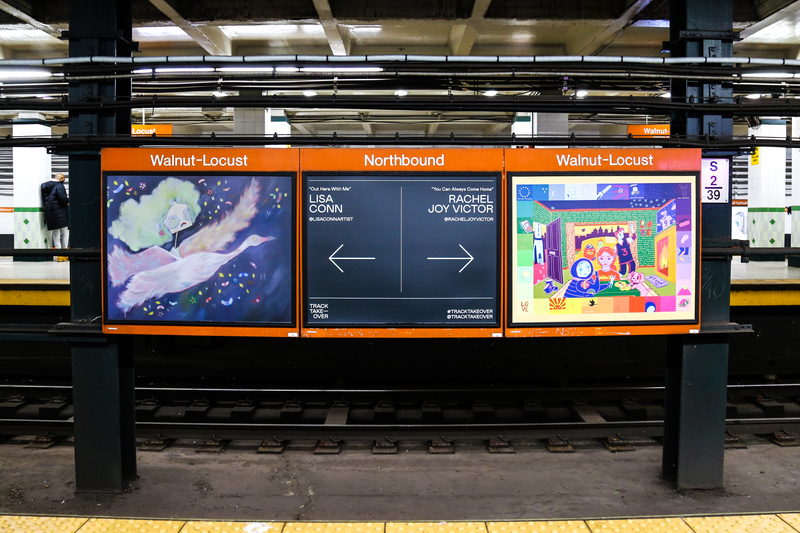 In the entrance of the station, each artist will have a dedicated vinyl print that previews their work, provides a short bio, and lists their Instagram handle. 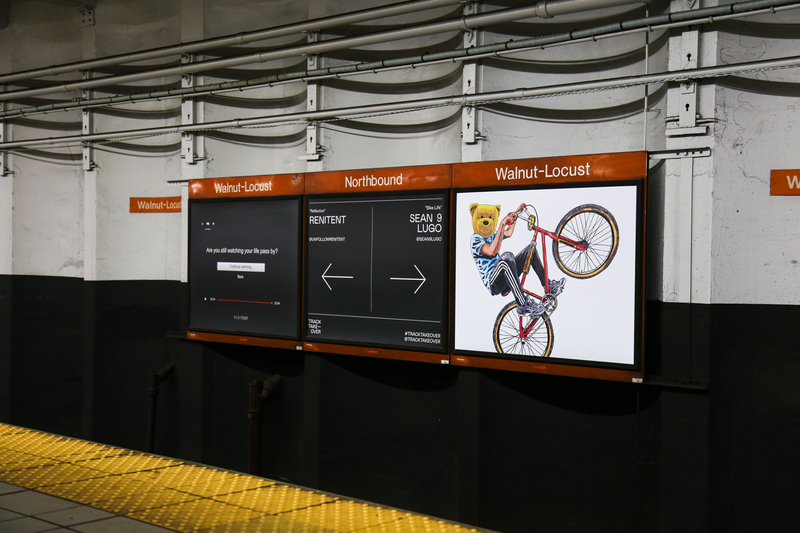 After commuters pay their fare, they will pass kiosks that serve as a “directory” for the exhibit below. 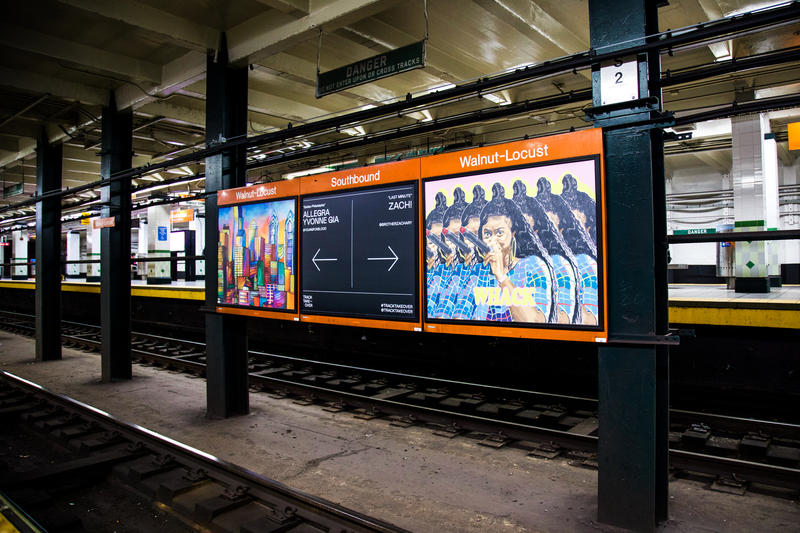 And, finally, while waiting for their trains underground, commuters will see each of the 30 artworks displayed on walls across the tracks, with attribution labels. 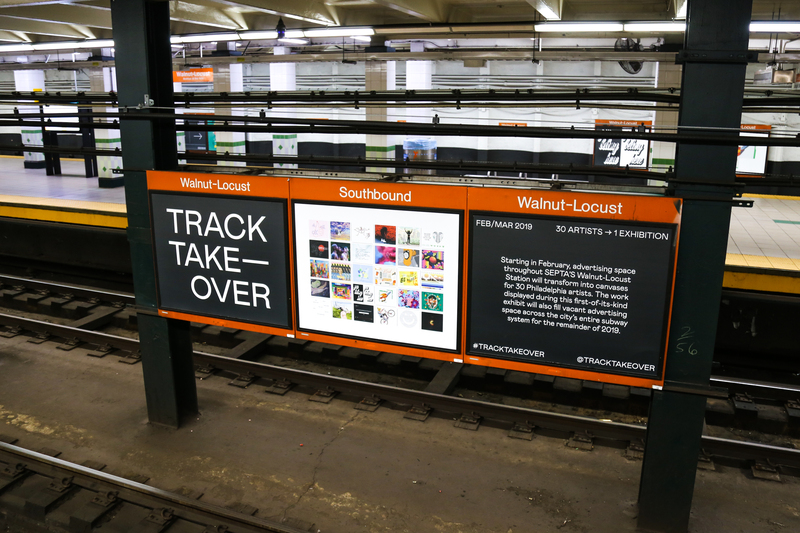 The Walnut-Locust Station Track Takeover artwork will be on view today through March 10. 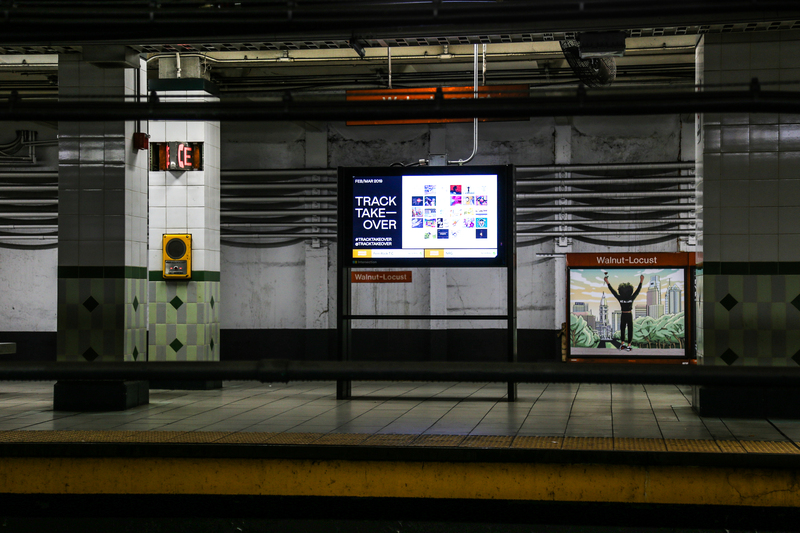 After that, the 30 pieces of art will be installed periodically throughout SEPTA’s subway system to fill advertising space for the remainder of 2019 thanks to the support of project partner Intersection, who manage SEPTA’s ad spaces. 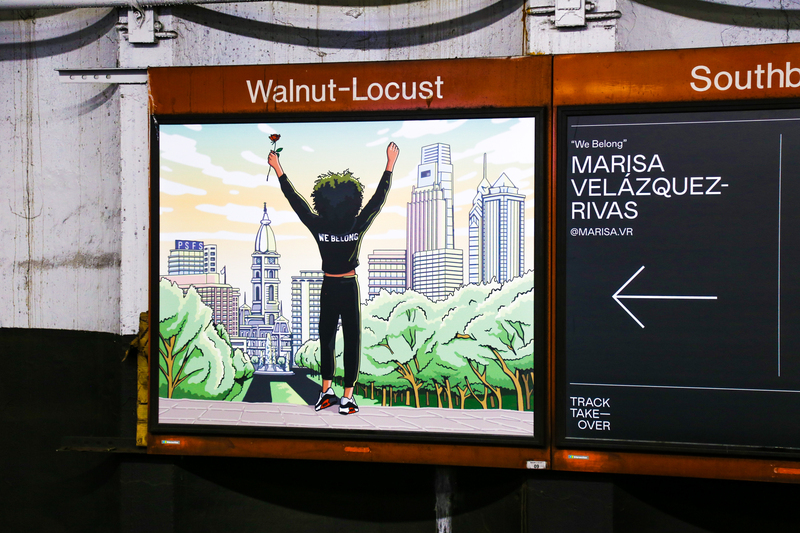 More than 6,000 people pass through the Walnut-Locust Station on a daily basis, making this in effect one of the largest art exhibits in Philly right now! Hope y’all will go check it out. Read more about last year’s Trashcan Takeover here! Next , put up posters of local missing children. Do something affirming.